The Hanoi-HCMC sector was among the world’s busiest air routes in 2018, according to a study by British aviation analysis company OAG. 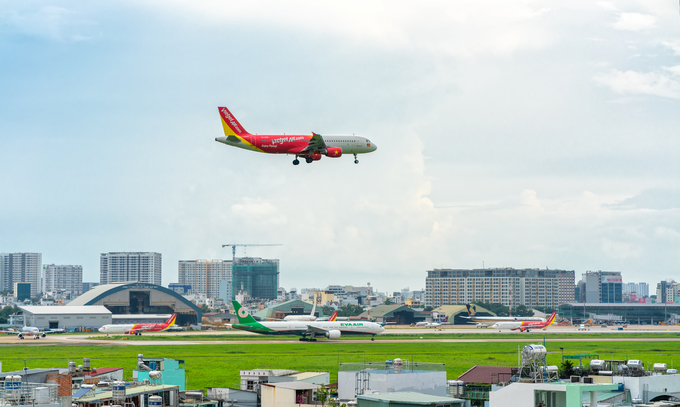 Vietnam Airlines and two low-cost airlines, Vietjet Air and Jetstar Pacific, operated a total of 39,291 flights between Noi Bai International Airport and Tan Son Nhat Airport last year, the sixth highest, up one spot from a year earlier. Asian routes accounted for eight of the top 15 spots based on the total number of flights between two airports. "Asia is once again home to the world's busiest routes," OAG senior analyst John Grant said in a statement. "In addition to the dominant role played by Hong Kong, Singapore, Kuala Lumpur and Jakarta have become Asia's new 'golden triangle,' offering similar benefits as major U.S. hubs, Boston, New York and Washington." The busiest route in the world was from South Korea's capital city Seoul to its Jeju Island, a popular vacation destination, with 79,460 flights, followed by Melbourne - Sydney (Australia), Mumbai-New Delhi (India), Sao Paulo-Rio de Janeiro (Brazil) and Fukuoka - Tokyo Haneda (Japan). The huge number of passengers traveling between Vietnam’s two major cities is putting an enormous strain in Tan Son Nhat airport in Ho Chi Minh City. It now handles 32 million passengers a year as against its designed capacity of 25 million. The government is working on the expansion of the two airports and construction of a giant airport in Long Thanh in Dong Nai Province, 40 km east of HCMC. The new airport is planned to be built in three phases over three decades with a capacity of 25 million passengers a year by 2025 and 100 million by 2050. Construction should begin next year with private funding prioritized, Deputy Prime Minister Trinh Dinh Dung said at a meeting last month. Routesonline, a U.K.-based aviation network, last month ranked the Seoul-Da Nang flight route number one in the list of 10 fastest growing passenger routes in the Asia-Pacific region.